March | 2013 | Lagusta's Luscious! 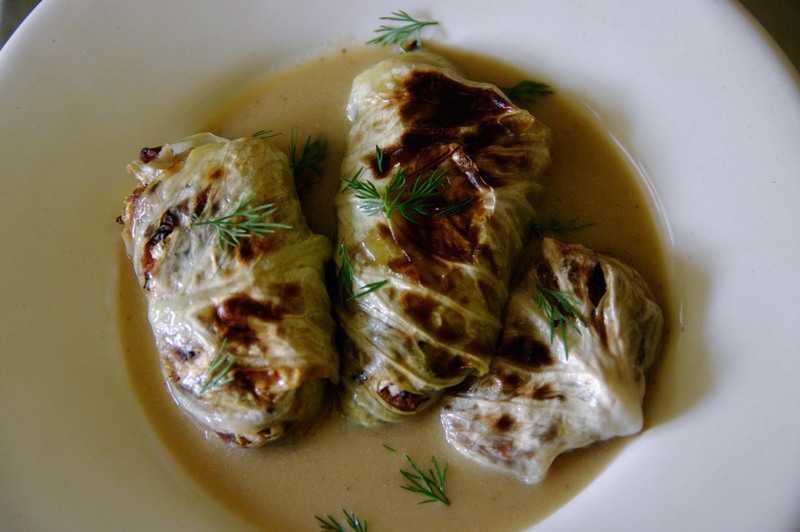 A customer of ours was browsing the archives of this blog, and asked if I could post a recipe of the Cabbage Rolls, because the photo looked so tantalizing. It does, they are, and I can. I’m happy to, because I love this recipe so, so, SO much. Like most good recipes in this world, it’s adapted from Bloodroot. Like most good recipes in this world, it’s a bit of work. Not too much though. And it’s fun work. Sauté onions and celery in a mix of ¾ grape seed oil and ¼ olive oil until lightly browned. Add apples and sauerkraut to frying pan and turn heat to high. Add more oil as necessary. Add caraway seeds and sugar and fry until sauerkraut begins to brown a little. Add garlic and sauté one more minute, stirring often to make sure garlic doesn’t burn. Turn off heat and add vinegar. Season to taste rather aggressively with salt and pepper. If using seitan, roast or sauté it until lightly browned, then add to mixture. Turn mixture into a bowl and mix with breadcrumbs. Let cool and adjust seasonings. Use a small knife to cut out the core of the cabbage. Bring a pot of salted water to a boil and place cabbage in, stem end down. 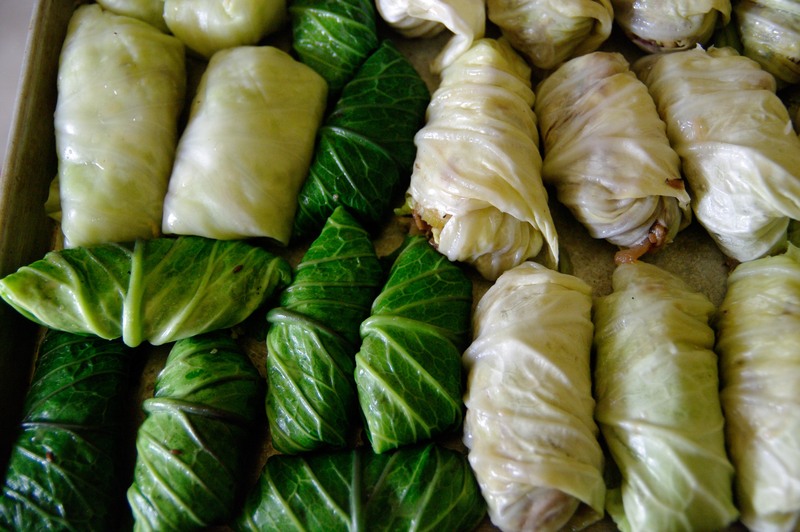 Cook until leaves begin to soften, about 3-5 minutes, depending on size of cabbage. Remove cabbage to a colander over a bowl and gently pull off as many leaves as are par-cooked. Return cabbage to pot as often as necessary until all leaves are par-boiled. If center vein of leaf is thick, cut most of it out. Hold one leaf at a time in your hand or on a plate, top generously with filling, and roll up. Tuck sides in and place in a shallow baking dish. Repeat. The smallest inside leaves of the cabbage will hold just a little stuffing like a cup. 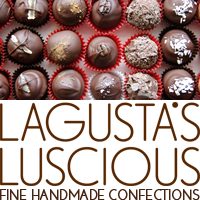 Lightly brush tops of rolls with oil and refrigerate until serving time. Rolls will need ½ hour to 45 minutes in a 375°F oven to heat thoroughly and to glaze the tops. If you want, you can baste the rolls with the Dill Sauce as they bake. Makes about 5 c—you definitely won’t need this much, but I like to make a lot and freeze it. It’s great on roasted vegetables. Heat grapeseed oil and flour, whisking constantly. When mixture begins to bubble, add remaining ingredients except dill along with 4 c water. Bring to a boil, whisking until thickened. Remove from heat. Season to taste with more salt and pepper as necessary, and add chopped dill. That’s it! Go forth! Make them, post photos of ’em on Instagram and tag them #lagustasluscious! Then eat up. Oh, and psst, if you like Eastern European heavy duty wintery dishes, you’ll probably go crazy for my Cabbage and Onion Pie.